On March 4, 1908, the Collinwood Elementary School burned to the ground, trapping and killing 172 school children, two teachers and one rescuer. The Collinwood Fire reanimates the inferno through the sensationalist newspaper headlines of the day and the silent moving picture images of an aspiring young filmmaker cranking his camera at the blaze. Daniel Houghton directs the Animation Studio at Middlebury College where he teaches intro to Computer Animation and leads small teams of undergraduate students through collaborative animation production projects. His animations have screened internationally in Europe, Asia, Africa; domestically in New York and Los Angeles; and online at The Atlantic, Huffington Post, Wired, PBS and over 250 blogs. He is currently working on an animated short about undocumented Mexican migrant farmworkers in VT.
PBS spoke with Director Daniel Houghton about his unique take on a disaster film, and the origins for The Collinwood Fire. 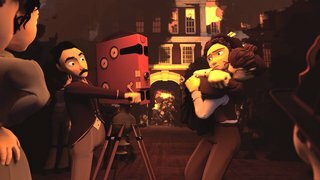 PBS: How did you come across this story and why did you choose to use animation to share it? Can you tell me more about the process that goes into making an animation like this? Daniel Houghton: I learned that a colleague at Middlebury College, Michael Newbury, was researching a turn of the century elementary school fire and found myself interested to discover what it might be like to animate this mostly forgotten event from American history. After deciding to collaborate, our process involved a lot of conversations, first between the two of us and then with the small group of students who had chosen to work on the project as animators. Those conversations became the start of a long search for a structure for the animation. What images should we show, and in what order? What should we put right in front of the camera? What should we push to the side? Whose story should we tell? How well should we get to know any particular characters? As we spoke we built rough models of each idea and iterated on the models until the structure of the piece slowly emerged. So that and the actual work of building the animation lead to the finished product. As the premiere public media organization in the state and surrounding regions, Vermont PBS offers the country's most trusted programs on air and online, as well as local programs that inspire and inform. Celebrating our 50th anniversary in October 2017.